KERALA is one of the famous Indian restaurants in Kyoto. 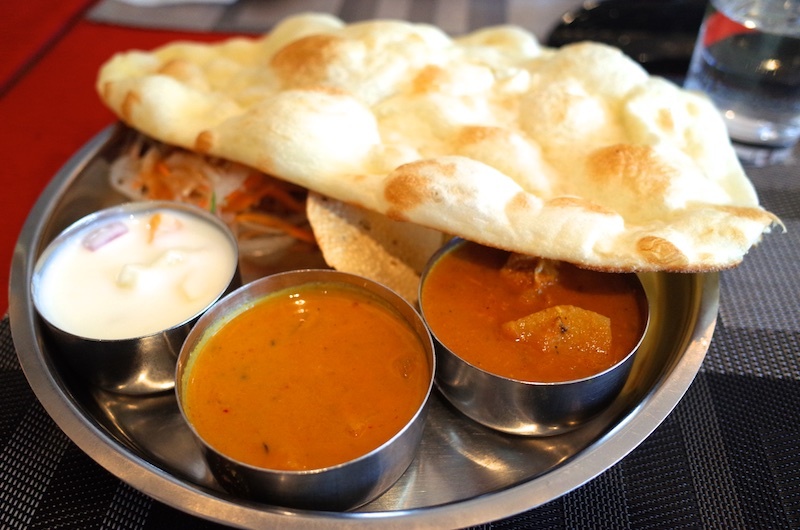 Usually, most Indian restaurants in Japan provide North Indian cuisine. However, it is rare that you could taste traditional South Indian cuisine here. Kerala, India is the birthplace of Ayurveda that is traditional system of medicine practice. KERALA provides light flavor and healthy cuisine with lots of vegetable based on an idea of the Ayurveda. Owner of KERALA is Maheshu Imai. He is from Kyoto. He leaned Japanese cuisine, French, and Italian, and then he took over KERALA from his parents. There are some repeaters for KERALA’s curries and some of them are coming from different countries. There are also some different kinds of Nans and different dishes as well! Their tomato soup is also famous!! You could have two different kinds of curries, rice, Nan, tandoori chicken, salad, and tomato soup or chai set at lunchtime with only about 900 yen. There is also vegetarian plate lunch for vegetarians. You may surprise their great cost performance. It worth to go and visit there! !